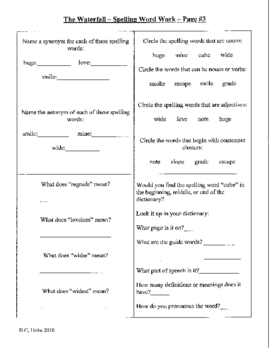 This is a set of 5 worksheets for practicing language arts skills related to the spelling and vocabulary words that go with the story "The Waterfall" from the Houghton MifflinÂ® reading program. 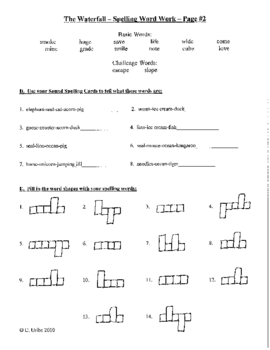 Skills include: ABC order, unscrambling, fill in the blank sentences, spelling using HMÂ® sound/spelling cards, word shapes, synonyms/antonyms, parts of speech, consonant clusters, syllables, prefixes/suffixes, dictionary skills including guide words, and basic word comprehension including drawing pictures to match vocabulary words. Great daily/weekly review of many skills! Great group work or independent practice--works for universal access or ELD--reaches all levels with everything from basic to advanced third grade standards!